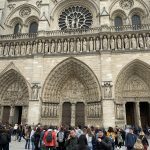 Every time I have walked in Notre-Dame Cathedral, I’ve cried. The setting, the stained-glass windows, the organ, the majesty of the place does this to me. And the personal memories. Now I have added the memory of live television images of flames rising from its sublime heights and its central spire breaking and falling like a mast of an old wooden sailing ship. The word impressionnant doesn’t do justice to the shock and despair of the moment. 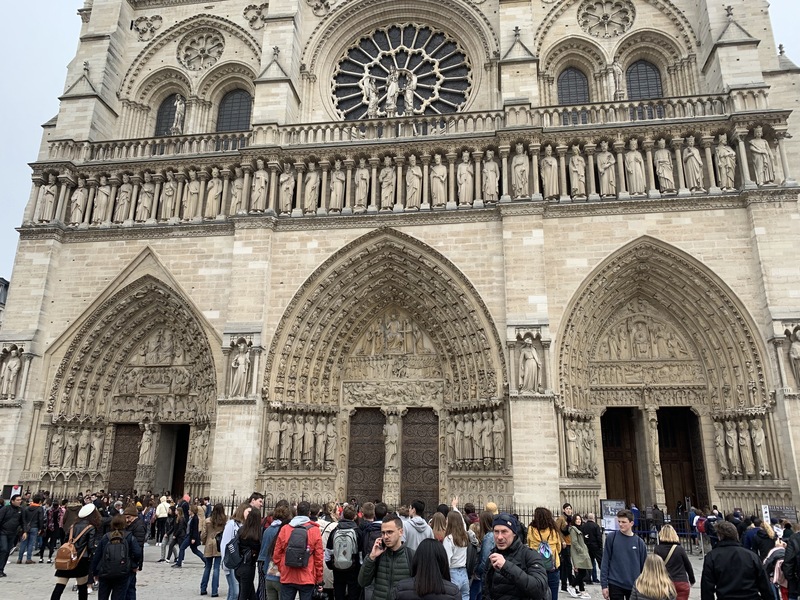 Although I am not Catholic, I have attended many masses inside this masterpiece of art, at Christmas or Easter particularly, for a few funerals, and many, many Sunday afternoon organ concerts when I was a student discovering Paris and all its beauties. Sitting there with friends and blankets (no heating in those days), we listened religiously, especially when organist Marie-Claire Alain would be on the program. Then we would head for a hot chocolate and a musical discussion. Bliss. Remarkably, just last week I was inside the Cathedral, and our visit will now serve as a momento mori. The old Cathedral is gone, and when rebuilt in some fashion, it will be someone else’s Notre-Dame. It had been years since I had been inside. Edward and I were walking back from a lovely lunch at Baieta and noticed the entry line was atypically very, very short—less than a minute—so we decided to take advantage of the opportunity, now a seemingly fateful opportunity. How infrequently do we revisit some of the wonders of a city transformed by tourism or commerce? I am so glad we had this last moment inside. We sat for a while in the prayer section to count our blessings, but then a sound system interrupted our revelry to remind visitors to be silent. A regrettable but probably necessary innovation. In the afternoon light we admired the glorious south and north rose stained-glass windows. Miraculous. Humbling. Unnerving to think of them perhaps melted away. Silence and meditation are part of visiting such a monument, inviting thoughts of the builders and supreme craftspeople who made it and the millions of prayers uttered there over the centuries. Awe inspiring, and I never leave untouched. Now, a week later, the tragedy happened. The world mourns, and I am back in New York, sharing in our collective tears.